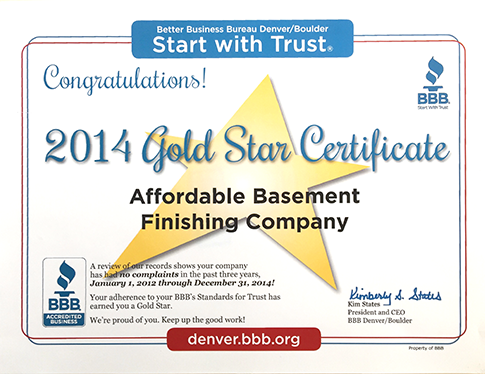 About Us - Denver, CO | Affordable Basement Finishing Co.
About Us – Affordable Basement Finishing Co. 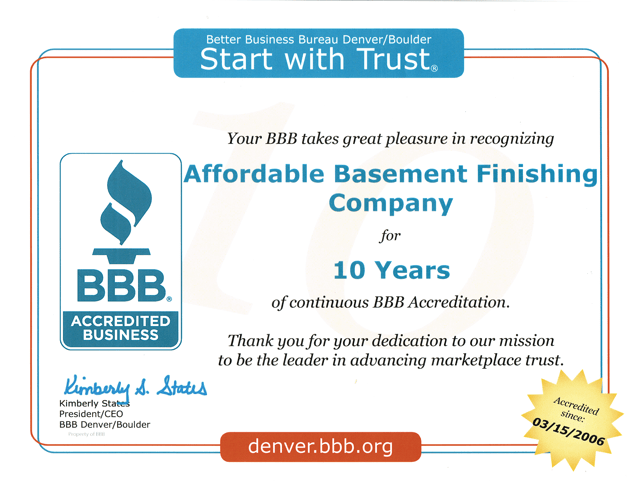 Affordable Basement Finishing Company is locally owned and operated and has been providing friendly and affordable services across Colorado for over 30 years. 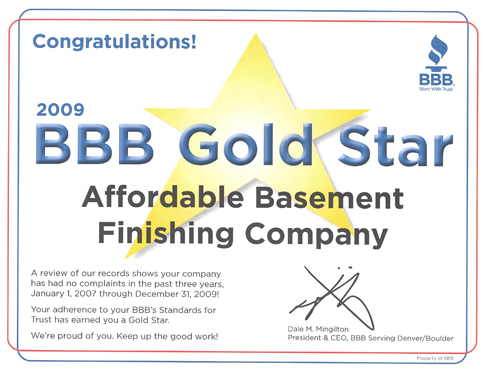 It is our mission to provide reliable, high quality basement finishing and remodeling services for all of our customers. Back in 1979, our owner and manager, Pete Enzinna, had a vision to create a contracting service that would benefit the average homeowner – just like you. He wanted to offer a service that, not only contributed to your comfort level in your own home but also contributed to your home’s equity. 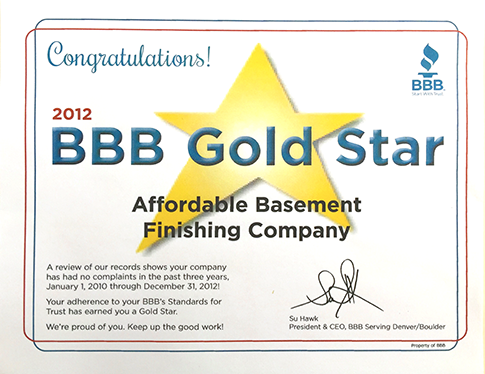 Finishing or remodeling your basement means added space AND added value to your home investment. We offer basement finishing and full basement remodels that can include the addition of a bathroom, living area, bedroom, or mother-in-law suite. We can also turn your basement into a home gym, home office, wine room, wet or dry bar, or even a home theater. The possibilities are nearly endless and are only slowed by your imagination. Before you can begin, it is important that you get an assessment to analyze, inspect, and possibly repair any structural deficiencies. Additional reinforcement, slab repair, or increased electrical work or piping may be needed. We’re equipped to handle every aspect of your basement remodeling project, from decoration and interior design to electrical and plumbing. Once complete, we can brainstorm with you and convert your ideas into a finished basement layout. When, and only when, you’re satisfied, we get to work! 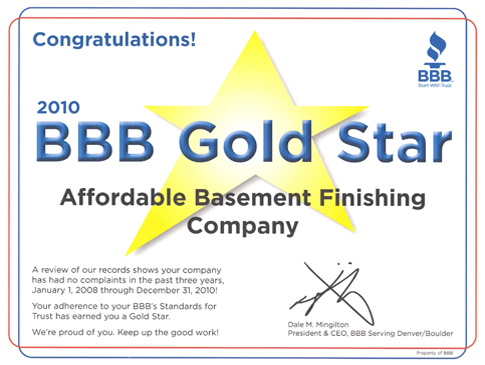 We provide a full, turnkey solution to your basement finishing or remodeling needs! 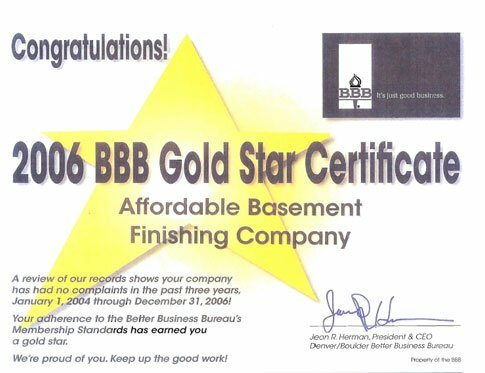 With our approach, you can have maximum security knowing that we will always take responsibility for our work, while being able to offer incredibly competitive pricing on basement remodels. Heck, being affordable is right there in our name! 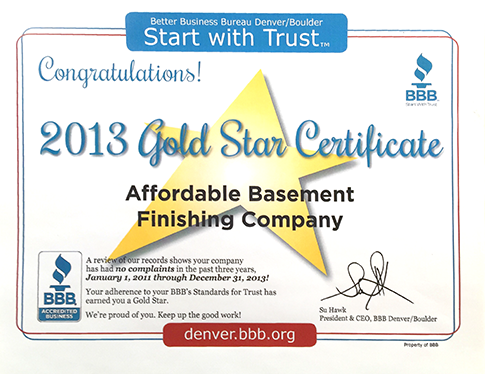 Affordable Basement Finishing has earned the Boulder/Denver area’s GOLD STAR CERTIFICATE, which is only awarded to companies that maintain a 100% customer satisfaction score with ZERO customer complaints for a period of 3 CONSECUTIVE YEARS. We truly love what we do, and it is our pleasure to do it for you. For us, there is nothing more satisfying that the look on our customers’ faces when they step into their new basement for the very first time. 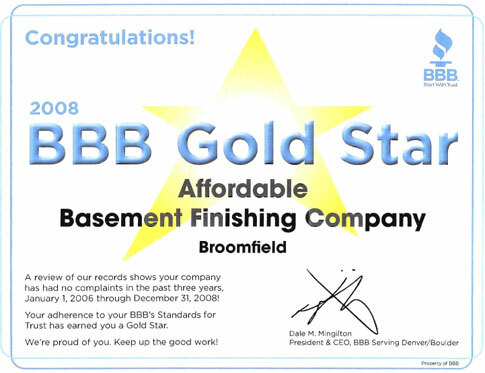 We pride ourselves on good ol’ word of mouth advertising and recognize that every customer is a chance to earn another. 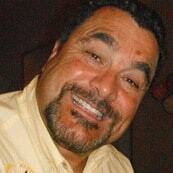 Our goal is to deliver professional personalized service and workmanship to ALL of our customers. We strive to complete each project successfully and on time with customer satisfaction our highest priority and something your family will enjoy for decades. Our success lies within our dedication to quality, responsibility and integrity – and to doing the right thing at all times, for you and your family. We’re glad you’ve visited our website and are reading what we are telling you we can do. We welcome the opportunity to show you. 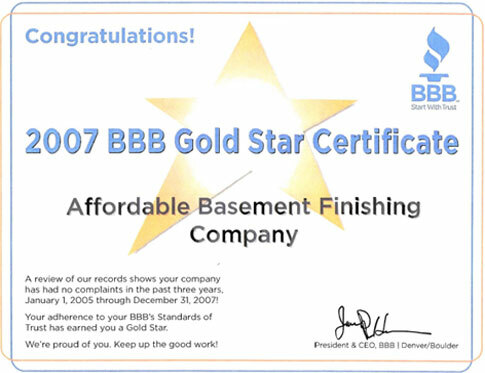 Give us a call today and let us help you make the basement of your dreams a reality! Also, special thanks to our partners over at Hi-Altitude Flooring for providing amazing floor options to our customers at great prices!